One of the perks of my job is that I get to work from home and, as a result I managed to talk my boss into forking out for a new laptop for me. After some consideration I went for the Asus UX32A, which is a halfway house between an ultrabook and a standard laptop. It’s much cheaper than an Ultrabook, but Asus have obviously cut some corners to meet that price point. The screen is a little disappointing, and it only comes with 4GB of RAM (although you can upgrade one of the modules for a total of 6GB). More importantly though, instead of an SSD Asus have opted for a ‘hybrid’ disk approach with this model. It has a standard 500GB hard disk, and a 24GB SSD which is used as a cache or buffer between the disk and the rest of the machine. The theory is that this allows much quicker access to things that you use regularly, while still aloowing the relatively huge storage space of a disk. The only problem is, this isn’t enabled by default! I was struggling to find out how to activate this feature on my new machine, but some quick googling led me to realise that I needed to install the ‘ExpressCache’ software from Asus (it’s actually a piece of software by a 3rd party company, but you need to Asus licensed version to run on the UX32A). However, here I hit another problem: the only link I could find to this software was a dead one. So install that (your computer probably needs a reboot after that install). run the ‘setup_x64’ executable in that directory. And then do another reboot when prompted. I was able to get rid of win8 on my zenbook and use win 7 now. The 24 GB SSD has 2 partitions on it. 4 gigs are used for Intel rapid start and the 18 left as SSD cache to speed up the hhd. I guess rapid start is no more than putting the hiberfil.sys on the ssd. If someone has an idea how to use the whole 42 gb ssd to use as sssd cache, please post here. Tall-Paul, thx a lot for sharing your experience! Great, thanks man. I had problems with my cachedrivers and spent a lot of time to find the correct drivers/software. Other ExpressCache software (from Sandisk for example) did not work. I could not find any info on Asus support or FAQ about this. Note: I am terribly disappointed in ASUS on this. The ultrabook is sold with an SSD supposed to act as a Cache. So the ExpressCache software should be supported, and if not it should be clearly explained. Note: I used this solution on the ASUS S56C Series, which is more or less the same but with a 15″ screen. Hello Koen. I just bought the S56CA and it came with the dreadful Win 8. Man I want to install the Win7 on it. Can you please help me out. my email is [email protected] . I plan to install the windows on the HDD and use the SSD as cache. But I am not sure how to do the second part. I have disabled UEFI and got the booting from disk option. Formated the HDD in fat32 format and installed win7. But i cant get to work the ssd as the cache! PLEASE HELP man I am in dire need! Thank you so much for writing this. ASUS wanted me to ship my laptop back to get this repaired or wipe my machine. This was an easy process but like you said hard to located instructions online. My laptop is a ASUS S550C and the ExpressCache was not enabled. Again Thank You! Thanks, found this on my ASUS S56CM now, turns out it’s already running but I see no access going on with the drive. I don’t know why they bury this. Just in case anyone is interested I have just successfully replaced the original hard drive on my UX32A with a low profile (7mm) SSD drive, pretty straight forward to do, remove the back & internal battery, then remove the HDD swap the mounting brackets over to the SSD put it all back & job done. I used a Samsung SSD that cme with Data migration software that made moving the OS & data to the new SSD painless. I now use the smaller SSD as a backup drive. how did you use the 24gb ssd as a drive? since installing a 500gb ssd i cant locate the 24gb ssd! when i cloned the hdd to an ssd i lost the 24gb ssd. does not appear in any partition manager. should i uninstall express cache and intel rapid start? Thank you so much for uploading these files. It worked on my asus S56CB notebook. Thanks! after downgrading from windows 8 to 7 i lost express cache and couldn’t figure out how to restore it. your guide helped a lot! did this on S56CB as well… very nice improvement. fresh install of windows 7 booted in more then a minute, with express cache and boot optimizing with windows toolkit the pc now boots at less then 20, and wakes for hibernare in about 10 sec! I am about to remove Win8 (with bloatware) from an Asus S46CM and your help file is the best I found so far AND includes all the files needed.. Cheers!!!! It seems that the download link is no longer active (I get a complain that page that states ‘cache must have to be writable!’). Would you possibly be able to fix tat or rehost the file? Ah ha! Thanks for pointing that out, I switched servers recently, looks like I messed some permissions up. Should be fixed now. The downloadlink is not working for me, and I can’t find the ExpressCache driver anywhere on the internet. Could you help me out? Hi, this is an extremely useful post. I discovered on my ASUS Vivo Book C550 that it appears the necessary software has been installed, but when I look at the drive, it still appears not to be formatted or being accessed as a cache. I tried to get into the ECCmd-exe -INFO listing, but it is not recognizing me as an administrator (although I am the only user and am the administrator). Any ideas how to verify this and if necessary format the SSD drive to operate as a cache? Looks like the download link still is broken. Have tried to find the ExpressCache software other places on the internet, but even on Asus homepage the link is broken. I have an asus S400ca with a 500gb had and a 24gb ssd. I did a clean install of windows 8 pro and deleted all partitions on hdd and ssd, so now I can’t install the intel rapid start technology driver the error says “my system doesn’t meet the minimal requirements”. However, I was able to install the ExpressCache driver and if I run the eccmd.exe -info I see information exactly like the one in the image of this post, how is that possible? Also, Any help or ideas for me to be able to install the intel rst driver? Please help! Can you mail me the link to download Express cache for Windows 7 64 bit. Oops, I’ve reset the permissions (again) should be fine now. Hi, I have an Asus S56C which includes a 750gb HDD and a 24GB SSD. I was messing around in the disk management area and deleted the volume (18.5gb) in my disk 1 area. I tried to do what you said to fix it, but there is also an OEM partition in there. 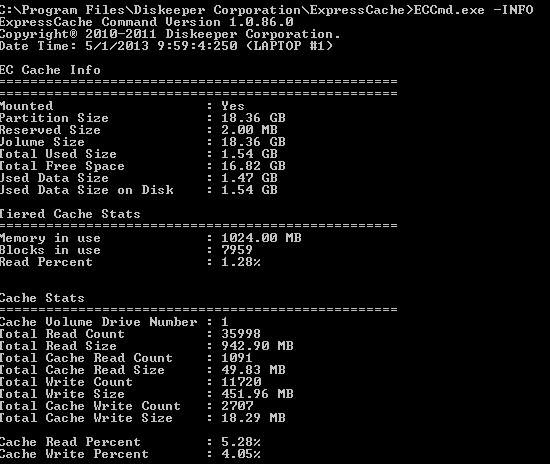 I am not sure how to get my express caching back in this case and there was no easily found answer online. Any suggestions? Would a restore to factory settings reset the partitions and functions? Thanks! When I run the “ECCmd -INFO” command, that stuff above pops up, but it seems like I have a bit of a problem.. It says that my Partitions Size is at 30Gb, and the SSD disk should only be 24Gb.. Your says 19Gb wich is a accaptable number. It doesn’t seem like it gets installed on the SSD disk, but is rather installed somewhere on the HDD? I replaced my hard drive with a SSD. I’m wondering if enabling expresscache is beneficial with SSD or if it’s not necessary. Any thoughts? First of all thank you so much for posting this info…It really is very special of you. I have an asus ux32a and a friend told me he had put a seagate hybrid drive which is part ssd and part hd into his mac and it improved the speed dramatically, and was a bit like a full ssd drive. Better still, it was 1 tb and really cheap compared to an ssd. Does anyone know if this would work if i swapped out my 500gb and replaced it with one of these hybrid drives. Lastly, i am holding off activating my ssd cache as in this posting until someone answers me in case that has an effect. Asus S46CM / K46CM, SanDisk U100 24 GB SSD cache disk, Express Cache, IRST, Intel Rapid Storage Technology, Windows, despair to happiness. Wow, thanks for this. Installed and now I shall wait to see whether this makes my ASUS UX32A run faster and not hiccup the way it is doing currently. Beggars belief that ASUS did not bother enabling the SSD caching and did not bother telling anyone about it, after all the marketing that accompanied the launch of the ASUS ultrabook line. Thank you so much. Couldnt find anything on Asus or Intel to get this to work. I have a k46CA. This worked perfectly. I also downgraded from Win 8 to 7.
how can i assure that it really is doing the catching?? MY QUESTIION IS : Why my Cache Read Percent is always 0.00% ?? Cache Write Percent : 0.00%, Cache Write Percent : 0.00% ? Thanks a lot! This saved me a lot of time and nerves. Was trying to set up caching within Intel Rapid Storage Technology utility that requires controller to be set to RAID mode which I couldn’t change in BIOS for some reason so it just wouldn’t work. Thanks for this. I’ve struggled with ExpressCache ever since I purchased the machine. This has finally enabled it but the Cache Read and Write Percentages are very low at less than 1% and the machine performance is still very slow. So I decided to try ReadyBoost, I uninstalled ExpressCache, deleted the ExpressCache partition using Disk Management, created a new partition and formatted it as NTFS with a drive letter R: (for ReadyBoost). I then enabled ReadyBoost on this new partition. The results are quite amazing, it seems like a different machine, considerably faster. The only minor downside is that Drive R: shows up in File Manager as being full and highlighted red and I obviously keep getting Disk Full messages. But that’s entirely optional and purely a personal preference. Thanks for the info on how to find the IRST and expresscache drivers. However, I have a problem installing those drivers on my recently formatted ASUS s550CB. First, I installed IRST and reboot, then nothing happens. Tried to open programs and features and search the app but couldn’t find any. Second, expresscache can be found on programs and features, but it does not seem to work (probably because the IRST hasn’t bee installed). Any suggestions? Tank you! You are the finally one ho could describe procedure as easy as it it. Just done it on ASUS S400AC for another reasons – after upgrade to 8.1 all partitions were messed up (HDD recovery, SSD all were erased) so i tried to find out what was it how to deal with it and so i formatted this disk over idk management tool for no reason actually. so if someone done something like that as well – please delete this partition again over disk management tool in windows and star installing of the express cache software. i also couldn’t find attachments, so i used asus support over drivers and tools for windows 8 (not 8.1 even if you run 8.1) to find those for my PC. I contacted ASUS to enquire whether the 24GB cache was enable or not and they say it definitely is. So why do some people think its not? Anyway, I have cloned the 500GB HDD to a 500GB SSD and the machine is now soooo much faster. I read that the 24GB SSD can be used as a small drive. How do you do this? Also, can the cache software be removed and if so which and how? Tried to download IRST and Newest version of expresscache but it would only half work. This works! My UX32A has always been quite slow despite its i5 cpu.. I called ASUS and they assured me the express cache was enabled. I have ‘upgraded’ from W7 to W10 and cloned the HDD to an SSD and now cant see the 24GB ssd anywhere! I have read that the 24GB ssd can be made to act as a drive. How do I do this? Meanwhile the MX200 500GB SSD has transformed the performance, but I don’t like W10! And another question: what about installing ubuntu on this cache 24gb disk? hi, thanks for the nice tutorial. when i run ECCmd as admin i get the message: expresscache driver not installed. any suggestion? I am attempting to download the asus ExpressCache files but I cannot seem to find them on your site. The “download” link on the blog does not access the file and I do not see a download available for it on your download page. Is there any way you may be willing to still share this file? I would greatly appreciate your help! Thanks! Is it possible to use cache disk for Ubuntu, so I would have dual boot? Thanks. THANK YOU FOR THIS WEB SITE! The information has been VERY helpful to me! I bought an i-7 (3537U) UX32A for my daughter about 4 years ago – it was on special offer – ex display model – and looked to be a very good spec for the price. I was curious about the 24GB ssd but never investigated it as it was her machine. About a year ago the hdd failed and I replaced it with a 500GB SSD (and inherited I the machine as I had to get her a new machine for college immediately). I assumed the 24GB ssd was part of the HDD module and was gone when I replaced it – but today while replacing the 2 GB ram module with an 8 GB module (going from 4GB(2+2) to 10GB(2+8)) I noticed what looked like a large memory module on the board which was separate from the built-in 2GB Ram and guessed that it was the 24GB SSD. One of the recurring questions here is how to find the 24GB SSD – left click ‘This PC’ in explorer or the desktop and select ‘Manage’. (you need to be using an admin ID). Then select ‘Disk Management’ under ‘Storage’ and you’ll see your main drive and the 24GB ssd as a separate device. On mine the space is completely unallocated – making me suspect that the express cache was not set up when the HDD was in place – which seems to support the suggestions that it was not enabled by default on the original configurations. Given the new SSD there seems to be little or no benefit in setting up express cache now, (though I will do a bit of reading to see what it does to be sure) so creating a new drive and using it for backup, or perhaps paging and hibernation files etc seems to make sense, either is pretty simple once you create a partition on the drive. Given that the 24gb is soldered to the main board using it as a backup drive seems like a bad idea, as it would be virtually inacessible in the event of a critical system failure.